A job ticket can't be opened without one. Every job ticket is opened for one client. The client account maintains important details about your customers: name, contacts, address, telephone numbers, and balances. Clients & Profits can manage jobs, estimates, costs, and billings for hundreds of clients. In fact, theres no real limit to the number of clients in your database (the limitations are based mostly on your hardware and network; more clients require faster systems). Every client has a unique account number or code. This code identifies the client throughout the system. Everything you do (time sheets, POs, payables, journal entries) gets a client code, which is copied automatically from the job ticket. This makes it easy to print job lists, cost summaries, and profitability reports by client. For better job tracking, you can have many clients from the same organization. A large corporate client, for example, might have 100 different departments or contacts who initiate jobs. Anyone who authorizes work can be added as a separate client account. When jobs are billed, the work from several different clients can be combined on one invoice -- and even billed to an entirely different client account. Costs, billings, and the unbilled amount are tracked on the clients job(s). Work in Progress reports are printed to subtotal by client, or printed for just one client or job. The unbilled amount on the clients job is updated whenever costs or billings are posted. So you can analyze the clients costs and billings anytime during the month. Clients can be billed automatically, based on the costs on the job. When the cost is posted, both the cost and the billable amounts update the job ticket. So when its time to bill, the total unbilled amount -- or any part of it -- is quickly and accurately invoiced. Many different billing types and options are available to customize invoices for different clients. Outstanding balances are tracked by client, so youll always know just who owes you money -- and for how long -- by printing client account aging reports from Snapshots. You can choose to age each invoice and subtotal by client, or just show totals for each client. Learn about adding and managing your client information in this Clients & Profits classroom video training session. Clients can be found in several ways: by account number; by organization name; by cost center; by sequence; or, by browsing through the Clients file. When the Clients window is opened, the last-used client is displayed automatically. 1 Choose My > Clients. 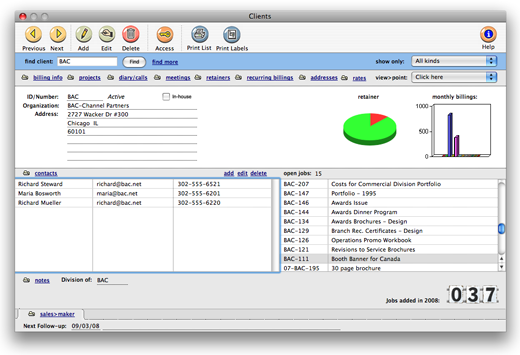 The Clients window opens, displaying the previously viewed client. 2 Click the >Find button (or choose File > Find Client). The Find Client dialog box opens, prompting you to enter a client number. You can find clients by organization name, cost center, or by sequence (i.e., the order in which clients were added) using the Find By pop-up menu. 3 Enter the client number, name, etc. then click Find. Sometimes its easier to find one client using the Lookup List. The Client Lookup List window shows clients and can be sorted by number, name, contact, or phone number. To use the Client Lookup List, choose Clients from the Lookup menu. You can add a new client by clicking the Add button. Clicking Update shows any newly-added clients. 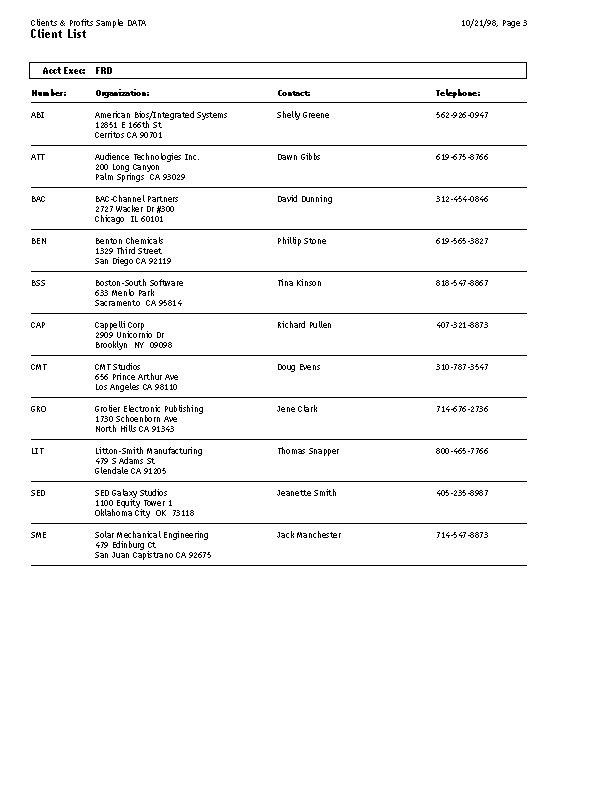 Also, a Client List can be printed from the Lookup List by clicking the Print button. Once the client is added and saved, it can be seen and used immediately by other users. The client's account information can be changed anytime. New clients can also be added while you're working elsewhere using the client's Lookup List. Click here for step-by-step instructions. Client account information is divided between several windows. Each window contains different kinds of information about a client, such as budgets, notes, and billing information. The basic name, address, and note is edited in the Clients window. Click here for step-by-step instructions. If a client has a balance, it cant be deleted. Even if a client has no unpaid balance, it cant be deleted if it has a job; if so, the job would no longer have a client. 1 From the Clients window, find the client you wish to delete. 2 Click the delete button (or choose Edit > Delete). The only way to delete a client is to delete its activity. This means long-time clients with closed jobs cant be deleted until their jobs are purged. It is best to leave the history in your database and instead mark the client as inactive by unchecking the Active checkbox. Client/Staff Access Privileges control who can see a client's jobs. They let certain users see a client's job tasks, while keeping out other users. If a user is given "no access" to a client, he or she can't see the job's tasks, estimates, costs, or billings. This option lets you define on a client-by-client basis just who can work with certain clients. Click here for more information. 1 Choose My > My Clients. 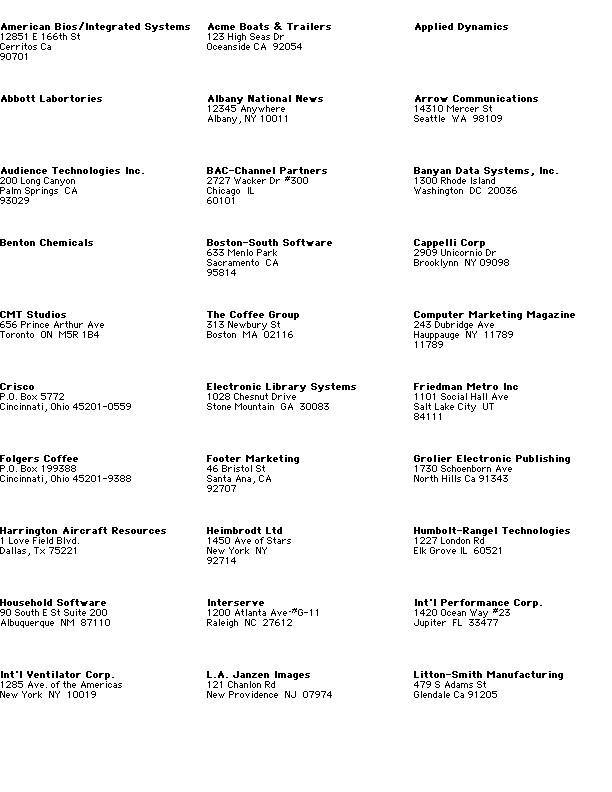 A Client List can also be printed from the Client Lookup List. To print a Client List from the Lookup List, click the Print button. The Client List doesnt show every bit of account information, simply because theres too much to print. If you need a special client report with different fields (such as cost center), create a custom report. 1 From the Clients window, find a client account. 2 Choose Viewpoint > View Job Tickets/Invoices. 1 From the Clients window, click on the Print Labels button. 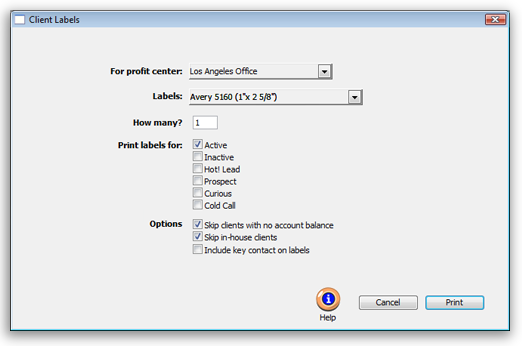 2 Select the profit center you wish to print labels for, the number of sheets you wish to print, and which type of client you wish to print labels for. You must select at least one of these checkboxes or the labels will not print. Client numbers are very important, since they appear throughout Clients & Profits -- and are used by everyone. Theres a real art to picking the right client codes. You must choose a number thats easy for everyone to remember, but meaningful enough to distinguish one client from another. The client number itself can contain up to ten characters, including letters, numbers, and symbols. If your job numbers are set to contain the client number, then your options are much more limited. Since the job number itself cant exceed ten digits, your client codes must be small if the job number is to contain the year, client, a dash, and the sequential number. Example: A client code RETAIL wont work if your jobs are numbered with the year and a dash. If the next job is 1024, the new job number for RETAIL would be 98-RETAIL-1024. Since the job number itself cant exceed 10 letters, it would appear as 98-RETAIL-1, missing three important digits. So its best to use short, simple client numbers (like ABC, RET, FRG, etc.). If you are worried about users not being able to recognize abbreviated client codes, remember that the client lookup list is available throughout the program. The client lookup list shows both the client code and complete client name. Clients & Profits manages different departments and divisions. Both are added as clients into your database. First, the division should be added as a client. Then every department that authorizes jobs should be added as a separate client account. Every client account has its own account number, which you choose. Departments are associated with the division by the divisions client number. 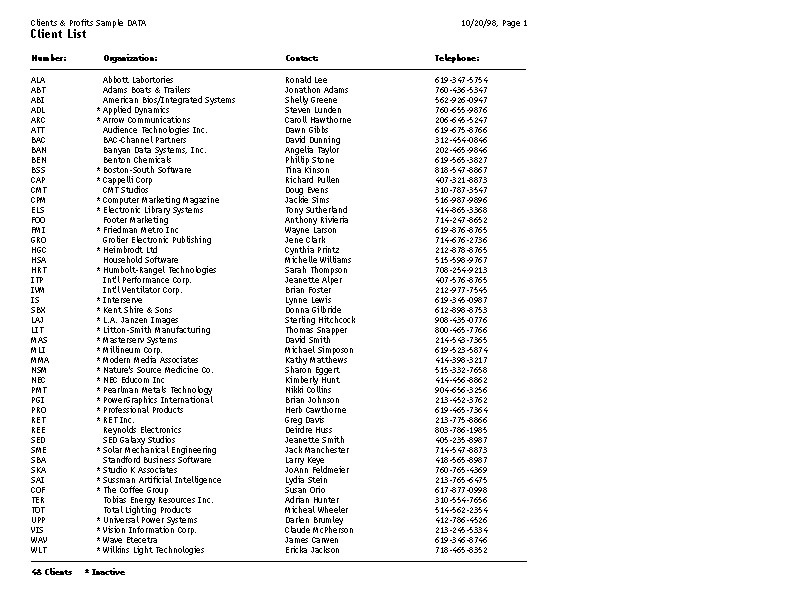 Each department client has a field for division -- this is the divisions account number. Client account agings, client statements, profitability, and productivity reports can be run by division. New job tickets should be opened for the department client number, not the division. This lets you track jobs by department, which is more informative. When a job is billed, you can change the client number on the invoice to another department -- or the division itself. By changing the invoices client number, youre billing the work to a different client. Regardless of who is billed for the work, the job is updated in the same way. For flexibility, the invoices billing address can be changed. Changing the invoices billing information only affects the invoice itself. This can be changed in the Client C&P Email window, which is part of client tools. The alert is set for each client, so this would have to be changed for every client that the administrator is set to receive new job alerts for. To do this, go to My > My Clients then choose Edit > Client Tools > Automatic E-Mail. From this window, de-select the person you wish to take off of the automatic e-mail alerts list.